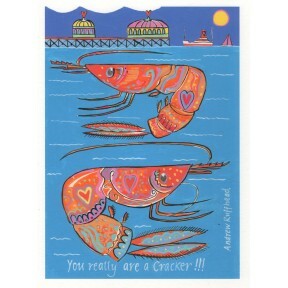 Andrew`s fun, quirky prints are taken from his original drawings, and are fun and affordable. 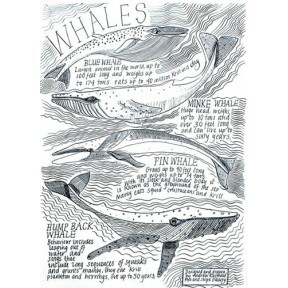 They can be bought framed or unframed in the Gallery, and unframed online. As many are A4 in size, they work well as a set. 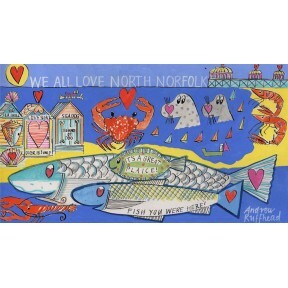 A great souvenir from your stay in North Norfolk, are both the `20 Great things to do on the North Norfolk Coast`, and the `North Norfolk` print. They are all printed on 250gsm acid-free archive -quality paper and each one is signed. 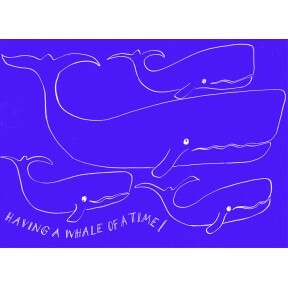 Whale of A Time .A4.Bright blue. Signed print.A4. Printed onto Innova 190 gsm paper . .. Signed print. A4. 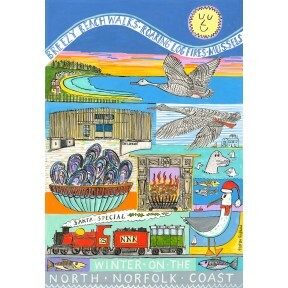 Printed onto 190 gsm Innova acid free paper..
Winter on the North Norfolk Coast. With Holkham Beach. with Pink Foot Geese flying overhead.. The cool new Lookout Cafe and Environmental Centre at Holkham, Baby Seals at Blakeney Point, Santa Special on the North Norfolk Railway, A roaring log fire, a bowl of Mussels.... and a festive S.. Signed print. A4. Printed onto Innova 190gsm paper ..